The English language’s oldest poem is stuffed full of action, told with a 360-degree vividness that makes each fresh scenario feel real. 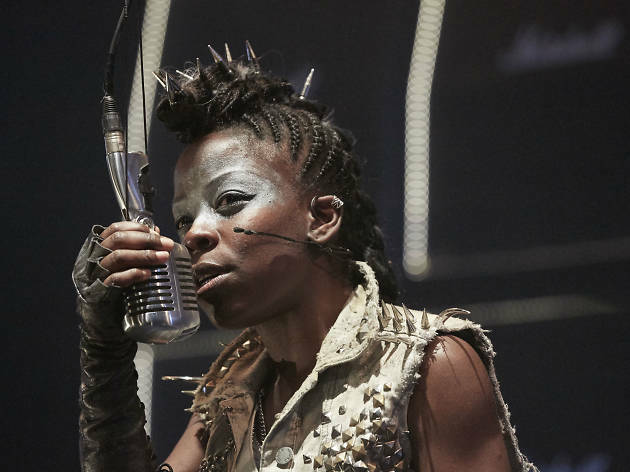 So Chris Thorpe’s decision to adapt it as a stage monologue – albeit one amped up with a stack of speakers, lasers, and even flamethrowers – makes total sense. Together with director Justin Audibert, he comes up with the coolest staging you’ll ever see for what’s nominally a kids’ show. Okay, it’s cool by the lights of a certain set of reference points – heavy metal and punk – that might not have so much cultural currency with kids in the era of vlogging. But the young audience seemed suitably awed by the uncompromising darkness of this ‘Beowulf’. 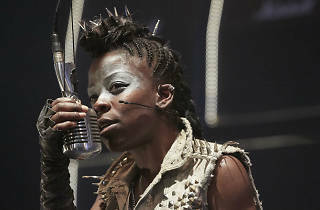 Debbie Korley plays the eponymous warrior king with shades of ‘Tank Girl’, tough in camo with metal spikes braided into her hair. She’s come to a strange kingdom to murder first the monster Grendel, then his mother, then a vengeful dragon. The fight scenes pit her words against furious electric guitar shredding from a masked adversary: Korley’s light voice can’t always hold its own against the din. Still, what does emerge of her story is pretty great. Chris Thorpe’s adapted text keeps some of the alliteration-heavy, dense rhythms of the original, mixing them with new lines that keep their spirit. There are some winningly self-aware references to the original poem: Beowulf says she’s not going to list all her ancestors, with their ‘names that sound like a cough’. And there’s an intriguing new mid-section where Grendel’s mum turns out to be half-human, begging Beowulf to end the cycle of violence. This feminist strand makes Thorpe’s play a fascinating companion to the blood-soaked original. But the strain of leaning in to catch each word makes it hard to get swept up in its story. Kids were yelping and whooping at the spurts of flame, but silent during the story’s battle scenes: call me naive, but I wish it was the other way round.